a) The sign of the cross that was revealed to Constantine the Great, the first Byzantine emperor, who contributed to the establishment of the Christian faith, did not herald merely the triumphant justification of Christianity. At the same time, it also sealed and underlined the truth that those who assume any authority whatsoever have to be prepared to sacrifice themselves for their people or with their people. b) Thus it was that the last emperor, Konstantinos Palaiologos refused to capitulate and willingly hand over the government of Constantinople to the enemy, even though he realized full well that disaster was on its way. He also refused to abandon the City, as the senators and patriarch advised him to do. “It may be” he said, “that my departure would benefit me personally, but it’s impossible for me to go. How can I leave the Lord’s churches, the throne and my people to such evil?”. c) He had no doubt been taught this moral stance by his mother, Empress Eleni, wife of Manouil II Palaiologos, who had successfully reared six boys and two girls. After the death of her husband, Eleni retreated from her worldly palace and lived as a nun for 25 years in the convent of Lady Martha, under the name of Ypomoni (Patience). She died a few years before the fall of the City and the Church honours her as a saint, celebrating her feast on 29 May. Saint Ypomoni may have chosen the monastic cell, but she always inspired a bold, peaceable and sacrificial mentality in her children. d) It is typical that, when Konstantinos Palaiologos sent his brothers, Thomas and Dimitrios to Mistra as governors, although there was a coolness between them, Ypomoni was not content with the customary leave-taking. She summoned the emperor and her other two sons to the monastery, together with senators and a mutual friend, Frantzis. She gave them her advice and then bound them with oaths to keep to the agreements and contracts: “So that no-one shall transgress onto the places or bounds of the other and seize them, but they shall work together in peace”. In other words, like a good governess and excellent mother, she achieved a meeting of minds. And this always happened, as Georgios Plithon-Gemistos notes. So her sons were always of the same mind and through the power of their mother’s intervention “resolved their differences quietly and calmly”. e) Saint Ypomoni did not benefit only her family. Anyone near her garnered spiritual fruits. Typical of this is what G Scholarios (who became Patriarch after the capture of Constantinople) reports: when a wise person visited her, they left amazed at her wisdom; if an ascetic met her, they would leave after the meeting ashamed at the poverty of their virtue; a prudent person would find their prudence enhanced; a law-maker would become more careful; a judge, in talking to her, would realize that he had a veritable manual of law before him. f) Scholarios goes on to say that a bold person would retreat defeated, astonished at her patience, prudence and the strength of her character; charitable persons would have their generosity reinforced; a pleasure-seeker would acquire prudence and repent, recognizing the humility in her face and person; a person zealous for piety would become more so; people in pain felt their hurt assuaged; the arrogant reined in their selfishness; in general, no-one came into contact with her but left feeling a better person. g) It was a phenomenon in Byzantium that emperors, members, male or female, of the impartial family, or other officials who had been involved in the administration would embrace the monastic life, as a consequence of some event or other. But the abandonment of secular offices and the choice of the “contemplative monastic life” of “practical philosophy”, asceticism and prayer was accompanied by a variety of motives. Some fell out of favour or were deposed from their office and, rather than being sent to prison or into exile, were forced into an enclosed monastery. There were others, however, who were content to leave behind the things of this world and live “in repentance”. 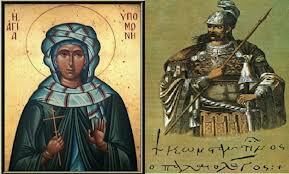 One such was Saint Ypomoni, who proved to be a model wife and mother and an example of the blessed life.